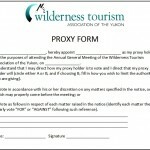 All full members of WTAY are entitled to submit one (1) proxy vote if they are unable to attend an annual general meeting or a special general meeting where their vote is requested. According to our Bylaws, where any proxy vote is authorized, amendments from the floor may be permitted in connection with the resolution or other matter concerning which the proxy vote has been taken, provided such amendments are not inconsistent with the substance of such resolution or other matter, and the proxy vote shall be recorded as if the amendment had been part of the original resolution or other matter of which notice had been given to the members. Proxy voting must be assigned to a voting member who is present at the meeting. And that member may only hold one (1) proxy. As well, it is the responsibility of the person to whom any proxy votes are delivered to deliver and announce the proxy votes at the meeting at which the resolution or other matter on which the proxy vote was taken is voted upon. Below you will find a link to download a proxy form or you can contact the office to receive a form via email or fax.